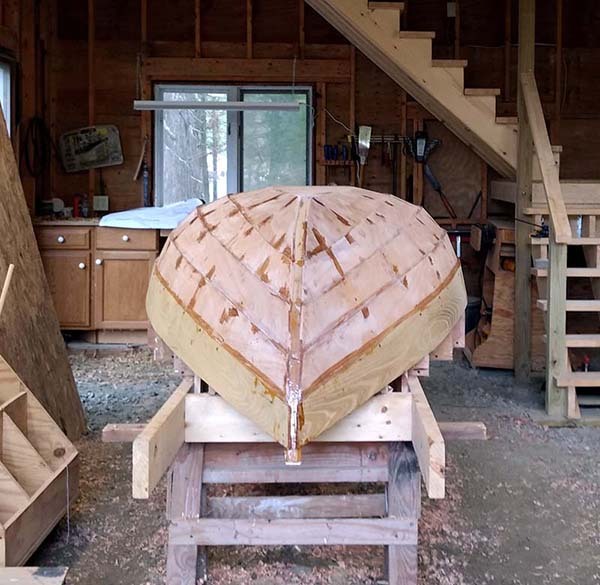 It seemed appropriate to build a Maine boat since we now live in Maine (while we lived in NJ I built the melonseed, of NJ heritage.) 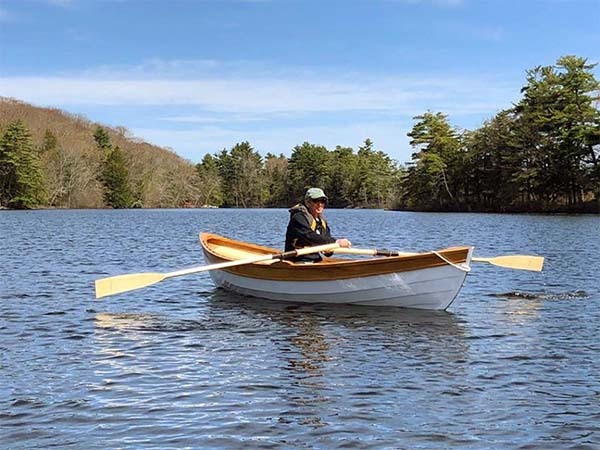 Peapods have a long history on this coast as being a very seaworthy workboat, sweet to the eye and a joy to row. 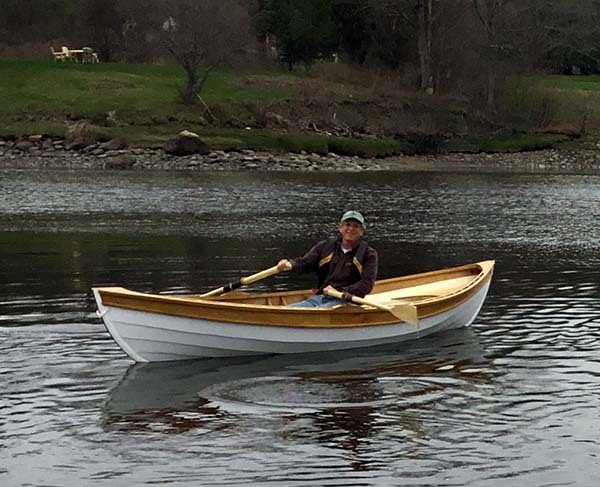 It is a Doug Hylan design, his 13' Beach Pea. 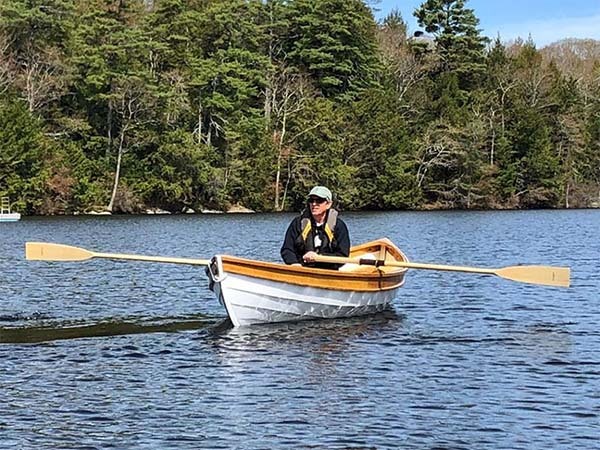 I've opted for the rowing version, no centerboard or rudder. 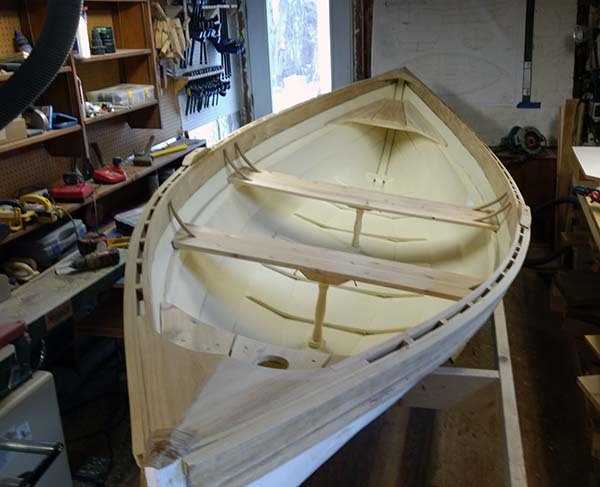 It will have a mast step so I can eventually play around with some downwind sailing. 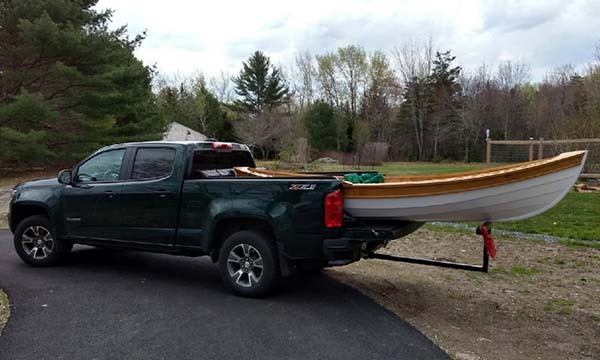 I want to keep it lightweight so I can put it in the back of my truck and not need another trailer. 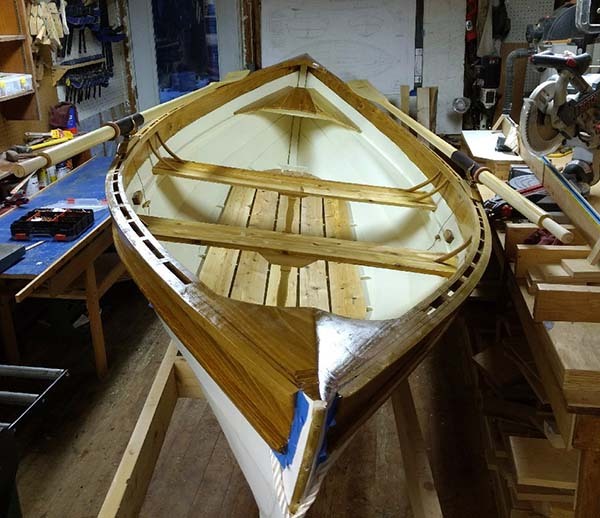 It is built to Doug's plans with the only notable exception is that I used black locust for the sheer strake, also for the inwales, gunwales, stems and floors. 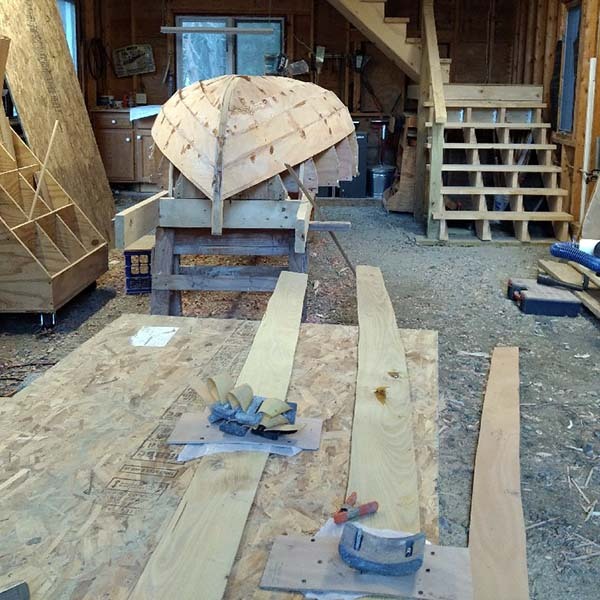 Thwarts and seats, and floor boards are eastern white cedar. It is glued lap construction using WEST System epoxy. 1st step, build the ladder (strongback). It makes a good platform for scarfing. 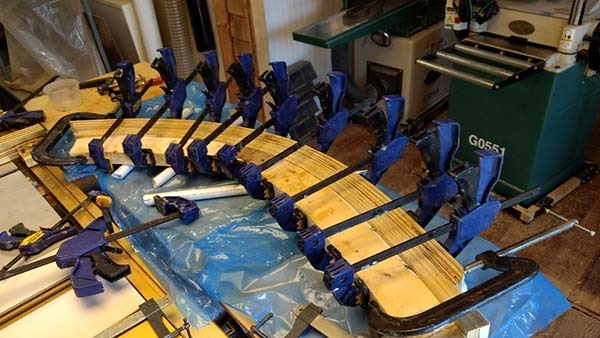 The stems were laminated out of black locust, inner and outer at the same time. 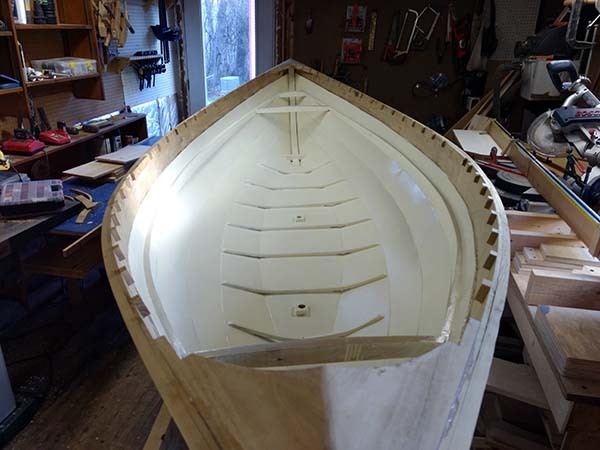 The 4 stems had to carved and planed but at least there were no transom knees to mess with. 1/4" Okoume marine ply was used for planking, 8:1 scarf. 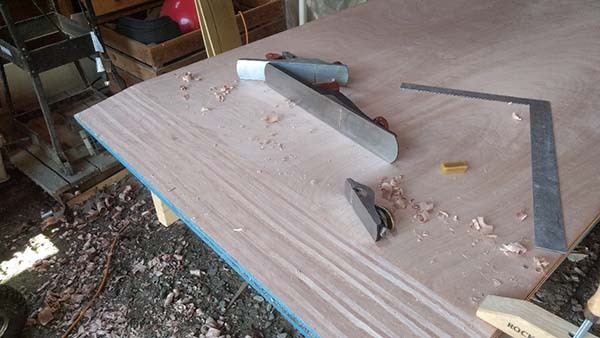 No power tools were used, just (sharp) planes which made the job more enjoyable as it went quickly and quietly. Planking was rough cut from patterns from the plans. 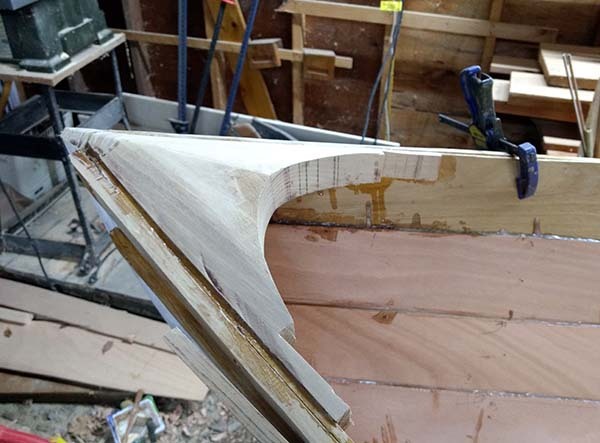 The sheer strake was got out black locust flitches and scarfed using a pattern lifted from the boat. I have to admit to a love/hate relationship with black locust with its wildly changing grain, checks and knots. But it's very strong, doesn't rot and looks great when oiled. Whiskey plank, or for me, beer plank, installed! 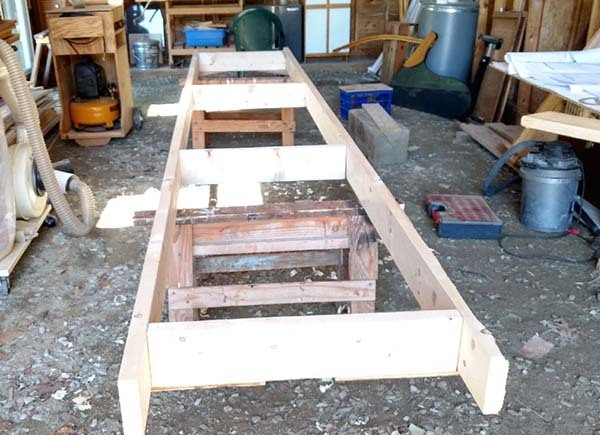 Bottom plank and garboards will be covered with dynel and 3 coats of epoxy, then CPES, and primed. The breasthooks are always a challenge with their changing compound bevels and of course high visibility. 2 hefty blocks of black locust cut on a 8 degree bevel and joined with a marine ply spline are the starting point. It took a lot of fiddling to get them to fit. They were made proud to be able to get a crown which necessitated a LOT of grinding and sanding. Final sanding waits for the inwales to be installed, which have to wait for the thwarts and thwart knees. This just makes me happy. 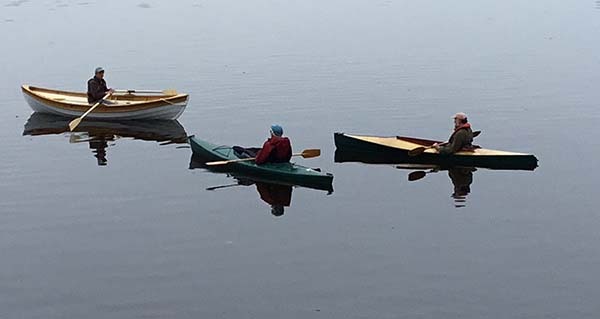 It is one of the main reasons we moved to Maine...to see this when opening the shed in the morning. 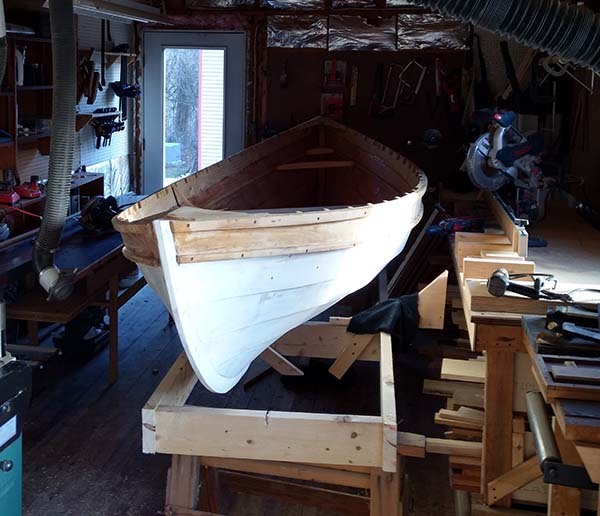 She's just got a coat of primer on her, but she's upright and is lookin' like a boat. 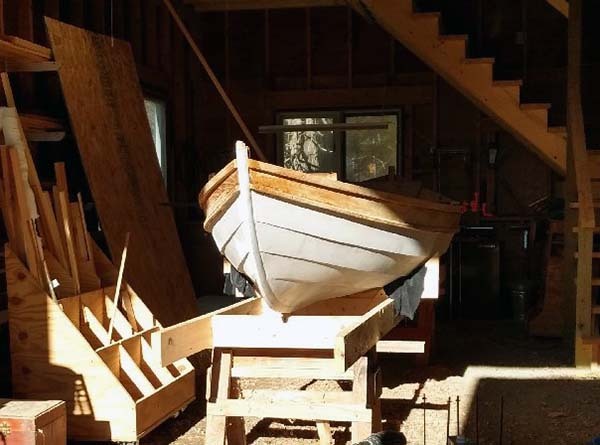 The seasons they are a changin' and it is no longer warm enough in the boat shed to epoxy, paint or really get much work done. So the shop tools have been pushed aside and the peapod squeezed into the small, but heated, workshop. Laminated black locust floors, thwart riser and seat supports installed. Interior has 2 coats of CPES, then primed and painted. Spacer blocks for inwales glued in place. Good thing it's a light boat as it has to be moved from side to side to get any work done. Inwales, oarlock pads in and bunged, thwarts installed and thwart knees, steamed, glued and screwed in place. Cedar floor boards are fitted and oiled and will be installed when the sanding is mostly done. Next, another turn over to work on the exterior. Getting close. A couple of coats of Le Tonkinois varnish-oil and a few more to go. I splurged on new Shaw&Tenny spoon blades. 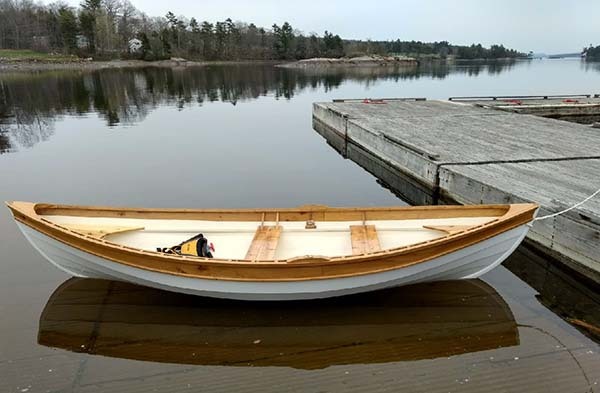 Still a lot of touch ups, and final painting but she's about ready to get wet, once the ice melts! It will be nice to be able to move around in the shop again. Launch day! 5 months and 5 days after the planned launch on January 1st, but the temperature was 50 degrees warmer. So a little drizzle was no big thing. Blue Hill town ramp, 1/2 mile down the road. Nice but tidal. 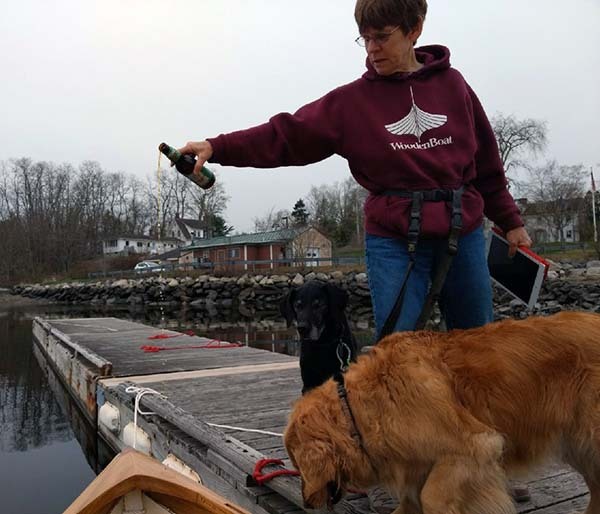 Susan christening with Shipyard IPA, a Maine beer, of course. Bags and Schooner are closely monitoring. Oh, yeah, she floats! Doesn't leak, rows like a dream. You could say I'm pleased. 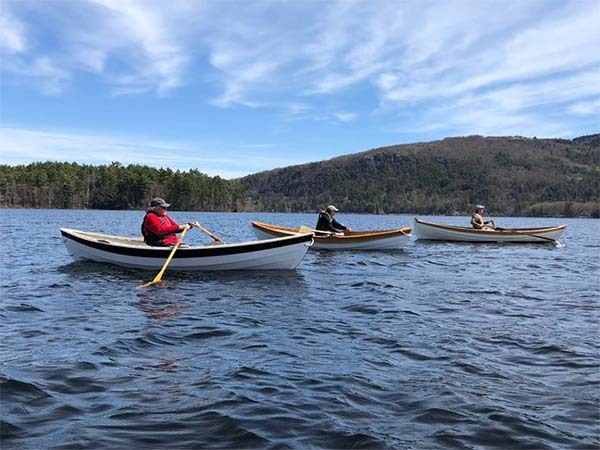 Nice row about the bay with David Wyman and Bill Corbett, TSCA friends.